genetically determined antigens (agglutinogens) present on the surface of erythrocytes. There are at least eight different variations, each being called an Rh factor (named for the rhesus monkey used in early experiments). If one of these factors is present in an individual's erythrocytes, the blood type is Rh positive (D positive, Rh0); if the factor is absent the blood type is Rh negative (D negative, dd, or Hr0 ). Approximately 85 per cent of all Caucasian people are Rh positive and 15 per cent are Rh negative; other races may have different percentages. The presence or absence of an Rh factor is especially important in blood transfusions because mixing of two types of blood may result in the agglutination (clumping together) of red blood cells, with plugging of the capillaries and destruction of the red blood cells. This agglutination is an immune reaction and depends on the formation of antibodies against the specific agglutinogen (Rh factor) present on the erythrocytes and in transfused blood. It should be pointed out that this immune reaction does not occur immediately, but depends on the gradual formation of antibodies; the response also is more severe in some persons than in others. Thus there may be no difficulty in the first transfusion of Rh incompatible blood, but on repeated exposure to the Rh factor, the Rh-negative individual becomes “sensitized” to the agglutinogens in Rh positive blood and builds up a greater quantity of antibodies. In pregnancy difficulty may arise when the mother is Rh negative and the fetus is Rh-positive. The Rh antigens (agglutinogens) in the fetal tissues diffuse through the placental membrane at birth and enter the mother's blood. Her body reacts by forming anti-Rh agglutinins; in future pregnancies these may diffuse back through the placental membrane into the fetal circulation and cause clumping of the fetal erythrocytes. This condition is called erythroblastosis fetalis, or hemolytic disease of the newborn. When the erythrocytes are destroyed, hemoglobin leaks into the plasma, producing jaundice and anemia. In utero, the hemoglobin is metabolized by the mother mainly; however, post partum, the neonate cannot detoxify the excess hemoglobin pigments such as bilirubin, and these may destroy nerve tissue and produce brain damage, a condition called kernicterus. The antibodies also may damage many other cells of the body. The fetal-maternal reaction is similar to an Rh-produced transfusion reaction in that the agglutination varies in severity and usually occurs gradually. An Rh-negative mother having her first Rh-positive child usually does not build up sufficient antibodies (agglutinins) to cause harm to the fetus, but in subsequent pregnancies with Rh-positive infants she may. The incidence of erythroblastosis fetalis in infants of Rh-negative mothers depends on the number of Rh-positive children she has. If the father of the children is Rh-positive and heterozygous (about 55 per cent are) about one fourth of the offspring will be Rh-negative and will not stimulate the production of antibodies in the mother. Scientific advances have helped reduce the risk to the Rh-positive infants of Rh-negative mothers. (See also amniocentesis, exchange transfusion, and intrauterine transfusion.) It is important to immunize Rh-negative mothers after their first pregnancy to guard against future Rh incompatibility reactions. 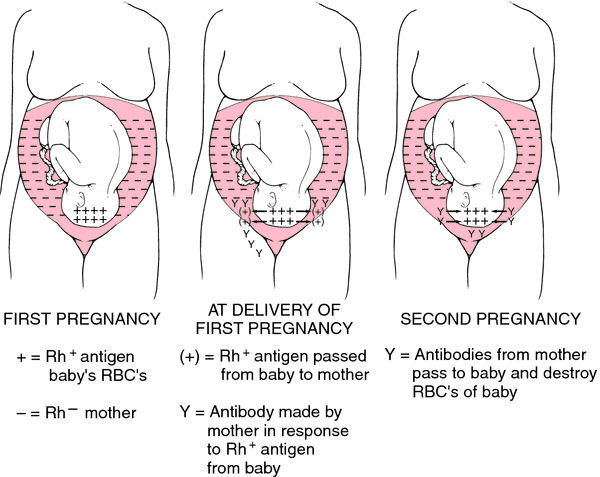 Immediately after childbirth, anti-Rh antibody (RhoGAM) is injected into the mother; it combines with Rh-positive erythrocytes or substances from the fetus that have entered the maternal circulation, and renders them inert (no longer capable of eliciting maternal antibody formation). Immunization must be repeated after each pregnancy, including ectopic pregnancies and miscarriages. The Institute for Clinical Systems Improvement has issued clinical practice guidelines for prenatal care that recommend RhoGAM immunization in the 28th week of the prenatal period. Maternal-fetal incompatibility. From Chabner, 1996.
the antigen of the Rh blood group system. See Blood Groups Appendix. refers to the D antigen, found on the erythrocytes of 85% of the Caucasian population and varying frequencies in other populations. Rh-positive or Rh-negative refers to the presence or absence of the D antigen, but many other antigens are also part of this system, most notably C, c, E, and e. D is the most immunogenic antigen outside the ABO system; therefore D-negative recipients should receive only D-negative donor blood to avoid exposure and immunization to D. D-negative mothers who carry D-positive infants should receive Rh immune globulin to prevent immunization during pregnancy and delivery. Also called Rhesus factor. See also anti-Rh agglutinin, erythroblastosis fetalis, RhO(D) immunoglobulin. A protein substance present in the red blood cells of most people (85%), capable of inducing intense antigenic reactions. A person who has the protein substance is calledRh-positive and a person who does not have the protein substance is called Rh-negative. Under ordinary circumstances, the presence or lack of the Rh factor has no bearing on life or health, except when the positive and negative forms commingle. The Rh factor was first identified in the blood of the rhesus monkey in 1940. Synonym(s): Rh blood group, Rhesus factor. An antigen present in the red blood cells of 85% of humans. A person with Rh factor is Rh positive (Rh+); a person without it is Rh negative (Rh-). The Rh factor was first identified in the blood of a rhesus monkey. A protein substance present in the red blood cells of most people (85%), capable of inducing intense antigenic reactions. A person who has the protein substance is called Rh positive and a person who does not have the protein substance is called Rh negative. n an antigenic substance present in the erthrocytes of 85% of humans. A person having the factor is Rh positive, and a person lacking the factor is Rh negative. They discovered, too, the Rh factor was responsible for infant disease erythrublastosis fetalis. Table 7 shows comparative study on distribution of blood groups of subjects according to Rh factor. When the foetus' blood mixes with the mother's, which typically occurs during delivery, the mother's body identifies the Rh factor as a foreign substance and begins to produce antibodies against it. Women may receive antibodies to the Rh factor during a blood transfusion, or they may develop them during childbirth or a miscarriage when some of the baby's blood seeps into the mother's bloodstream, he says. In routine blood typing, testing for the D antigen, known as the Rh factor, is performed. 99 The RH Factor - Distractions (0602498885062) pounds 12. Unique to this study was the fact that Micronics was able to accurately determine both the blood type and Rh factor of each sample provided in less than 30 seconds using its easy-to-use, disposable, manually operated device. There are four types of blood O, A, B, and each type can be positive or negative, referred to as the Rh factor. The RH Factor is Roy Hargrove in groovemeister form, and this EP follows on from his album in the same guise. The Company is using its patented Transrenal DNA-based technology platform to develop a number of medical tests for infectious diseases including AIDS and tuberculosis, and for important prenatal genetic testing, including gender determination, Rh factor incompatibility, and Down syndrome. Conduct "Blood Bank" as the determination of the blood group system AB0 and Rh factor, the performance of cross matching tests and issuing blood and blood products ready for rolling with the release of the host contract premises under a lease agreement and commitment to lease laboratory equipment and accessories Laboratory of Laboratory Diagnostics, Warsaw Hospital for Children SPZOZ for the duration of the agreement and the acquisition of five employees Employer. The RH Factor is trumpeter Roy Hargrove in what the publicists are calling neo-soul/jazz.